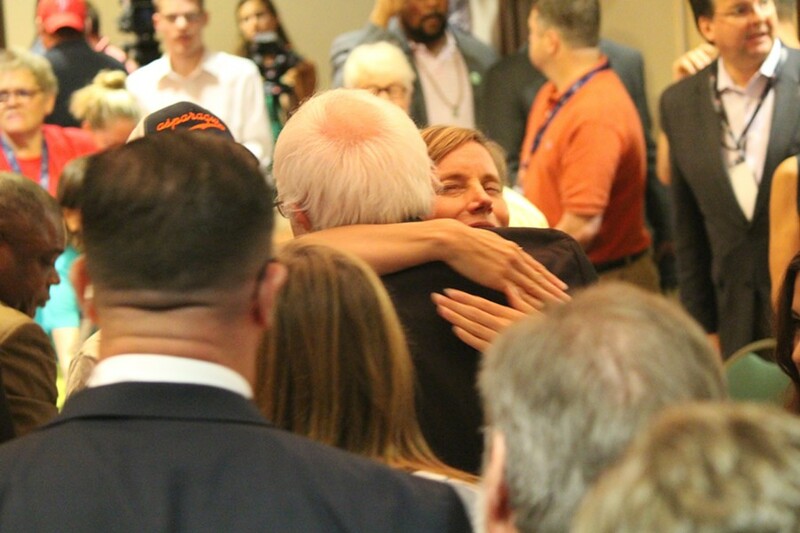 Sen. Bernie Sanders hugs Vermont delegate Shyla Nelson Wednesday morning in Philadelphia. 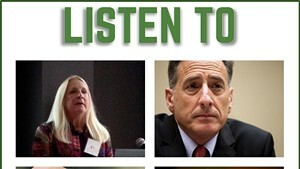 On Tuesday afternoon, Norwich resident Shyla Nelson received a call from Sen. Bernie Sanders (I-Vt.). "He said, 'I need your help. Would you be willing to nominate me for president?'" the classical singer recalled. Nelson, who had traveled to Philadelphia to serve as a Vermont delegate to the Democratic National Convention, obliged. 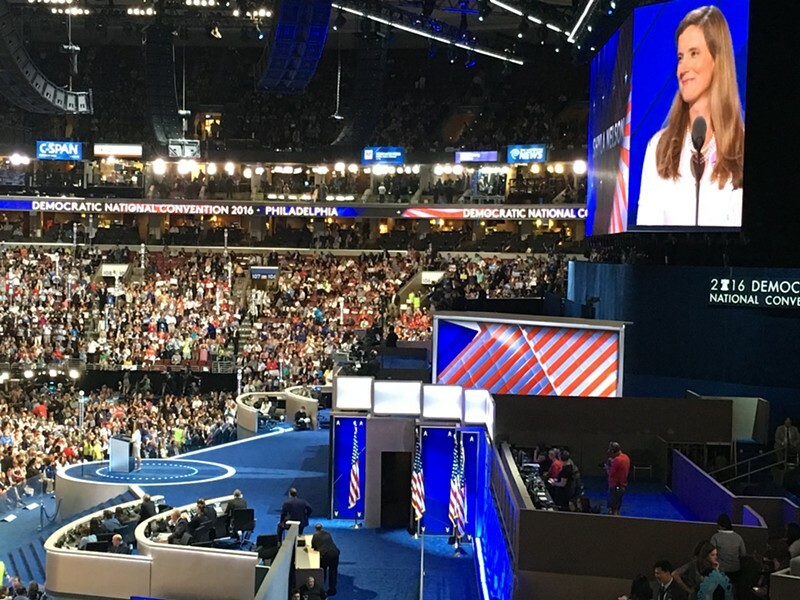 Hours later, she stood onstage at the Wells Fargo Center to formally second Sanders' presidential nomination. "I have never felt the Bern more than I do this moment," she told thousands of cheering Democrats. "We will never stop working for a future we believe in. We will never stop fighting for the change we need. And we will never forget the man who leads us." The next afternoon — halfway through the convention — she was on her way home to Vermont. "I've fulfilled the commitment that I came here to fulfill, which is to pledge my support for Bernie Sanders," she explained as she walked out the door of the Wyndham Garden Hotel. "I am not prepared at this time to continue the process of this convention as I'm not yet prepared to offer my support for Hillary Clinton's presidency." 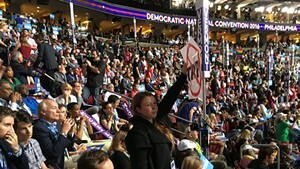 Shyla Nelson seconds Sen. Bernie Sanders' presidential nomination Tuesday at the Democratic National Convention in Philadelphia. Earlier that morning, at a breakfast for northern New England delegates, Sanders had thanked Nelson for doing "a great job" on short notice. And he had urged his delegates to rally around Clinton in order to defeat Republican nominee Donald Trump. But Nelson wasn't yet convinced. 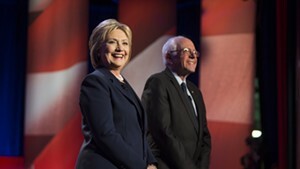 She said Clinton still had "an uphill battle to establish trust and credibility among progressives." 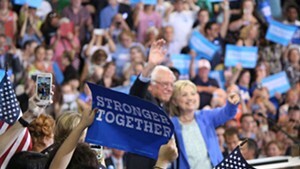 And she wanted to see real changes to the Democratic nominating process — specifically, the elimination of unpledged superdelegates. Until then, she would not participate in the pageantry. "Bernie specifically has asked for us to be respectful — to not boo," she said. "My intent here is to respect his request and also respect the fact that many of us are not yet ready to provide unity — especially when we feel so many voices have been left unheard by this process."